Packaging Details Height Width Depth Weight 8.87" 15.25" 10.0" 185.24 oz. Details Dietary Supplement. Nature's Ultimate Lean Muscle Formula. Lean body breakthrough. Burn fat! Don't store it! Zero lactose. Creatine GCC - Increased anabolic creatine output. » Micellar Proteins - Stimulate muscle synthesis. » LeanLipids - Designer fats promote leanness. » Growth Peptides - Boost nitrogen balance. » Complete A-B Caseins, Peptides and Lactalbumins - Trigger new growth. » Lactoferrin - Increase oxygen delivery. » Secretory IGA - Fight overtraining. 80% of saturated fats are in the form of medium chain triglycerides (MCT's). MCT's are typically burned as energy and show little or no propensity for storage as body fat or as a contributor to arteriosclerosis. Nutrition Facts Serving Size 1 packet Servings Per Container 1 Amount Per Serving % Daily Value 2 cups low fat milk Calories 348 Calories from Fat 162 Total Fat 18 g 28% Saturated Fat 8 g 40% Polyunsaturated Fat Cholesterol 3 mg 1% Sodium 200 mg 8% Potassium 595 mg 17% Total Carbohydrate 12 g 4% Dietary Fiber <2 g 8% Sugars 6 g Protein 32 g 64% Vitamin A 33% Vitamin C 33% Calcium 33% Iron 33% Vitamin D 33% Vitamin E 33% Biotin 33% Chromium 100 mcg 83% Copper 33% Iodine 33% Magnesium 33% Niacin 33% Pantothenic Acid 33% Phosphorus 33% Vitamin B12 33% Vitamin B6 33% Zinc 33% Riboflavin 33% Thiamin 48% Folic Acid 33% Thiamine 33% *percent Daily Values are based on a 2,000 calorie diet. Ingredients: Evopro Our Custom Protein, Peptide and Amino Acid Matrix Designed to Closely Reflect the Nitrogen Components and Ratios Found in Human Mother's Milk (Micellar Alpha and Beta Caseins and Caseinates, Whey Concentrates Rich in Alpha-Lactalbumin, Whey Isolates, Whey Peptides, Purified Bovine Colostrum Extract Rich in Secretory IGA and IGF-1, Glutamine Peptides, L-Taurine, Lactoferrin). Leanlipids Lipid Complex Selected for Thermogenic and Unique Energy Properties (Canola Oil, Enzyme Engineered Polyunsaturated Long-Chain Vegetable Oils, MCTs, L-Carnitine), Fructose, Maltodextrin, Cytovite I, Vitamin and Mineral Premix Consisting of (Vitamin A Acetate, Cholecalciferol, d-Alpha-Tocopherol Acetate, Ascorbic Acid, Folate, Thiamine Monohydrate, Riboflavin, Niacinamide, Pyridoxine HCL, Cyanocobalamin, Biotin, Pantothenic Acid, di-Calcium Phosphate, Potassium Iodide, Potassium Chloride, Ferrous Fumerate, Magnesium Oxide, Copper Gluconate, and Zinc Oxide), Natural and Artificial Flavors, Creatine GCC, Our Proprietary, Endogenous Creatine Precursor (Glutamine, Betaine, SAMe [S-Adenosylmethionine]), Acesulfame Potassium, Sucralose, Chromium Nicotinate. *These statements have not been evaluated by the Food and Drug Administration. This product is not intended to diagnose, treat, cure or prevent any disease. Directions Take Muscle Milk anytime you would take in a shake or gainer, but want a better tasting, more anabolic formula. Mix 1 packet in 10-12 oz water. Want even more satisfaction? Mix with low-fat milk. Tastes like a real milk shake. Honest! After Workouts: After workouts, the body is in a catabolic state. Muscle Mix helps reverse this muscle breakdown by tricking the body into muscle synthesis when you normally break down muscle. Prior to Bedtime: Sleep is actually a catabolic period. Remember, breakfast means to break your fast of the night. During any fast, you break down precious muscle tissue for energy. 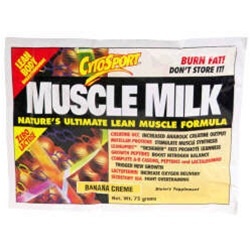 Muscle Milk will help you wake up more anabolic.